New release of VS Portal and also our new module VS PBX enable users to hear voice messages, left for them in voicemail, directly from the web. It is possible thanks to flash streaming technology incorporated in the voipswitch’s web interfaces. Users do not have to download the message to hear it which could be problematic with longer messages. Instead the system streams the voice automatically adjusting to available bandwidth. Also a user does not have to listen the whole message, he can simply hear part of it and then skip the rest moving to next message. 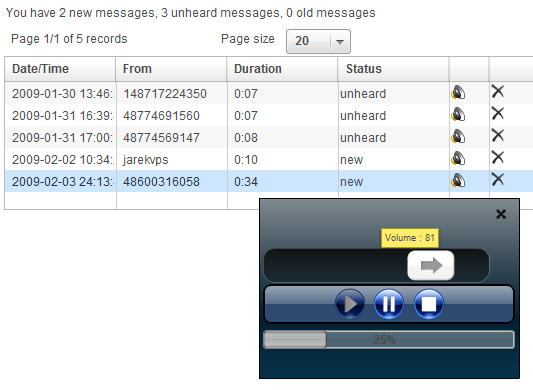 In addition there are information about the caller ID that left particular message, duration, date/time and status. User can also remove the message directly from web.